The financial management of disasters and crises is a key challenge for developing countries; choices made about how to respond have enormous impacts on poor people. 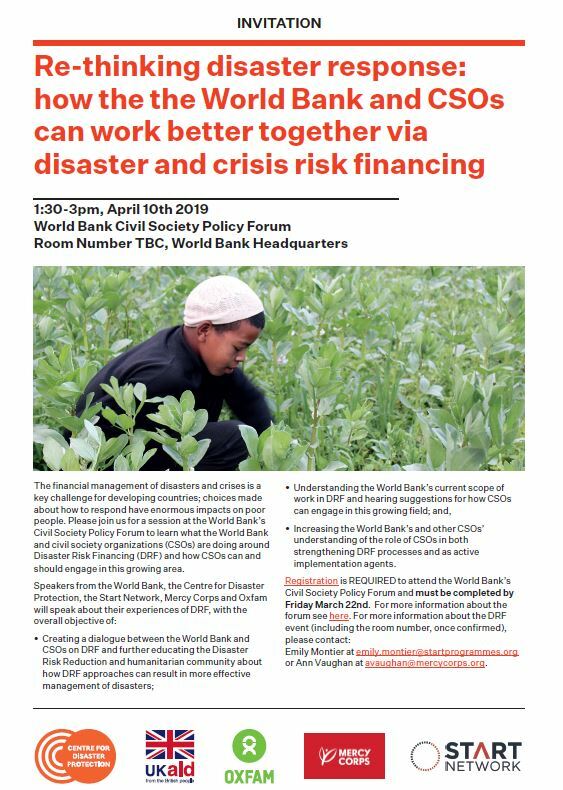 Please join us for a session at the World Bank’s Civil Society Policy Forum to learn what the World Bank and civil society organizations (CSOs) are doing around Disaster Risk Financing (DRF) and how CSOs can and should engage in this growing area. Increasing the World Bank’s and other CSOs’ understanding of the role of CSOs in both strengthening DRF processes and as active implementation agents. Registration is required to attend the World Bank’s Civil Society Policy Forum and must be completed by Friday March 22nd. Read more information about the forum. Emily Montier at emily.montier@startprogrammes.org or Ann Vaughan at avaughan@mercycorps.org.